A reader recently emailed me asking how to maintain her personal style while also maintaining her health. She needs to wear orthotics and her podiatrist recommended flat lace-up shoes. She desired tips on how to style shoes with orthotics without having to resort to a menswear-inspired wardrobe. Style these days isn't so black and white and the past few seasons have shown a blending of masculine with feminine, fancy with casual, flamboyant with minimalistic. We're in a time when it's easier than ever to take care of your health without sacrificing your style. 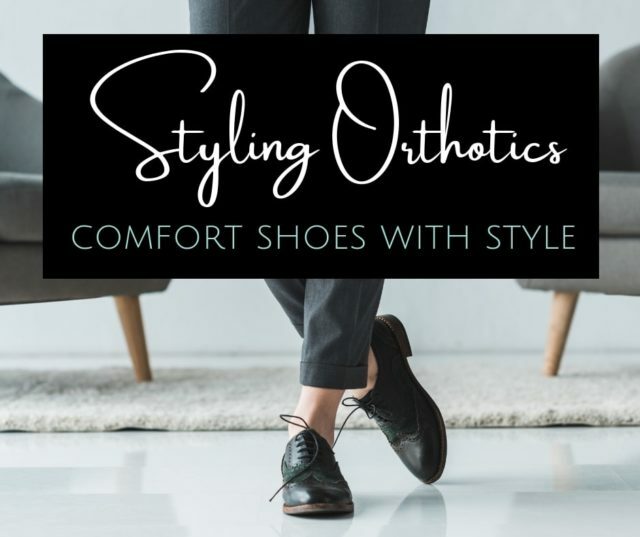 Below I share some examples on how to style shoes with orthotics without sacrificing your style. To answer this amazing email, I didn't just write out my thoughts, I made a video. Seriously, this woman's email is AMAZING and deserved to be read/heard completely. I also think as we get older, it's an issue more and more of us deal with. This is my first video of this type and you can tell I didn't get too fancy. In fact, I was so inspired I filmed it right from my desk in my home office after reading it, propping my phone up with a crazy mix of contraptions, sharing my tips off the cuff. If you like it, let me know and I'll continue doing videos like this from time to time (and next time I'll angle the camera better!). Lace-up shoes can give a retro edge to modern clothing. Amp up that vibe with full skirts that nip in at the waist. In the first look, Taylor Swift balances a more masculine shirt and shoes with a girly bag, skirt, and classic red lip. In the second look, Georgette makes a retro silhouette modern with a monochromatic ensemble. In the third look, by balancing the short flippy skirt with touch jewelry, menswear-inspired shoes, and an all-black outfit the result is super chic and sophisticated. This season is all about juxtaposition and you will be likely to see plenty of girly frocks paired with loafers and brogues this spring. The sturdy shoe grounds a frothy flippy dress, and the juxtaposition of feminine with masculine is what makes the look so fresh and modern. Take a color from the dress to choose your shoe to make the look cohesive or choose a low-contrast neutral like tan, beige, cream, or camel to elongate the leg. The first look from J. Crew balances a “borrowed from the boys” classic loafer with a clutch purse and floral dress. Brogues, loafers, and lace-up shoes look great with a short shift dress. In the first example, Lizzy pairs a pale pink dress with pale pink brogues. The low-contrast color elongates her legs and makes the lace-up shoe look more dressy. The second look is a great example of how to highlight a statement shoe. With a simple black shift and minimal accessories, the shoes purposefully take the spotlight. The third look as seen at Anthropologie is a great way to style flat shoes for fall, winter, and spring. With lower temps, add thick tights in the same color as the shoe to elongate the leg and let the dress shine. Brogues, loafers, and other shoes that accommodate orthotics look great with jeans and casual pants. While these three looks are very different, the consistent theme is that the pant is very narrow and slightly cropped to show the slimmest part of the ankle. On top, wear what feels right to you. In the first look, a long cardigan with blouse is a Casual Friday staple. In the second look, Gabi continues the mint green theme with a sheer blouse and statement jewelry. In the third look, Olivia styles a winter classic of leather leggings and a chunky sweater but adds her spin with a denim “band jacket” and red nails. This is the most classic way to style brogues and other shoes that fit orthotics. It's a bit borrowed from the boys but with a feminine edge. Note the pants are sleek and slim and cut to show the slimmest part of the ankle. No sock hiding that skin, that peek of skin (which we have if we wear pumps or low-vamp flats) is what adds a feminine touch. Going with long over lean is also a way to prevent the look from being too masculine. Whether it's a sweater coat like the first example taken from J. Crew or a blazer as seen in the other two photos, the topper is a bit longer and a trim fit. Depending on your personal style you can add your own touch to the look. While the first example is quite minimalistic, she has a delicate necklace to keep it from being too severe. The second two looks incorporate classic feminine details – a bow at the throat, a pearl necklace, a clutch purse. Match your shoe with your hosiery or pant. By having the two match, it creates a continuous line. This will elongate your legs, highlight the top or dress, and minimize the shoe. This is a great trick for, especially bulky shoes. When possible, choose a slimmer sole. A lug or chunky sole makes a shoe appear casual, no matter the outfit. A slimmer sole (especially one the same or similar color to the shoe) will look dressy and more professional. Consider an almond-shaped toe. Pointed toes rarely have enough room for feet let alone orthotics. However, an almond toe (a tad bit elongated and slimmer than a round toe) will have both the room and the style. This is a more elegant shoe style and the extra length will balance any bulk necessary to accommodate your orthotic. When the weather allows, show a hint of ankle. While old style rules state that one shouldn't show ankle because it shortens the leg, it actually makes the look more modern and fresh. Long pants with lace-up shoes are dated, even for menswear. A hint of ankle (and a hidden sock) will make your shoes look purposeful. Make friends with a tailor. 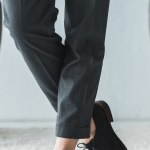 When it comes to styling such shoes, it's important that your pants are the right length and have the right width of leg opening. A tailor can make such alterations quite easily, and your looks will feel more cohesive. Be sure to wear the shoes and the proper undergarments when visiting your tailor. If it's hard to explain what exactly you want, bring photos as examples. Treat a tailor like a hair stylist; the more often you go the better rapport, the more she will understand you and your vision. I have a pair. I’ve tried styling it over and over and always end up removing them. After this post, I’ll try again. Hi Alison, thanks for the useful post. I’ve been using Superfeet soles, per my physical therapist’s recommendation and they’ve really helped. Also after pregnancy, my feet got wider and I now make sure I generally wear wide sizes. Unfortunately, there’s not a lot of hip choices in wide sizes. 🙁 Sometimes, going 1/2 a size up helps. Anyway, when we approach spring, I’d love it if you’d do a section on hip, attractive orthotic sandals! I meant to add — summer season is a challenging time to wear comfortable sandals that aren’t boring or ugly. Can’t just add orthotics or soles to sandals! Great topic! I’ll look into this. Thank you! Having trouble finding shoes that fit my wide feet, I really enjoyed this post. Still, I would like some advice on how to include socks without looking dated. Living in a sub-arctic climate I am rarely able to show bare ankles with jeans. I love to wear dresses in summer without the hassle of pantyhose, but I rarely feel comfortable because I generally feel cold around the ankles. I would love to wear socks instead of pantyhose, but it just looks weird to me. It is harder with socks, and we all deserve to be warm! I’d have the sock either match the shoe exactly, or go totally with contrast and choose a stripe or pattern that makes a statement. I have large, wide, flat feet and have had surgeries on both of them. My ankles are chubby, which makes me leery of ankle pants, but I’ve decided I don’t care! Appreciate all the good suggestions in the comments, too. Anyway, love love loved this post! Alison, Thank you for focusing on style for women with orthotics!!! You gave several great tips about juxtaposition. I have had to wear thick custom orthotics since my 20s (for almost 30 years now) and can relate to the letter you read! Most of my podiatrists also recommended lace-up shoes, but I love shoes, and I just don’t want to wear that one kind all the time! Everyone’s feet are different, but I have found that as long as I choose shoes that fit well and have enough volume/high enough sides to accommodate my orthotics, I don’t have to stick to lace-ups. The key for me has been to realize that I need to invest in comfort shoes with thick removable comfort insoles…then take out the insoles and replace them with my own orthotics! I have several cute pairs of flat booties from Naot that look nothing like comfort shoes. Aravon makes some nice sandals that hide my orthotics, Keen Elsa tennies work, Alegria makes clogs that can be cute with some outfits, and Ugg’s shoes with removable sheepskin insoles can work for winter. Above all, I feel best when I “own” my shoe choice; I think it’s quite powerful to say, I’m a stylish woman, I take care of my health, and I won’t sacrifice my comfort or balance for any reason! Wishing you and your letter-writer the best, Alison. I love your blog! I’m so glad you liked the post, Amy! And thank you for sharing possible shoes that work with orthotics, that is so helpful! I loved the video! I vote for more. You’re a natural on camera as your enthusiasm for the subject matter really comes through. I’d love to see more fashion videos. As a lover of brogues I’m excited to be able to wear them with a much wider range of clothing choices (a few years ago I probably never would have paired them with a dress). I’m glad we’re starting to realize the importance of good foot care, which includes proper shoes. I wish I had never gone barefoot in the high heels (3+ inches) I wore a couple decades ago. I still have corns on both sides of my feet by the baby toe and no matter how I think I’ve gotten rid of them they just keep coming back. If I had only taken better care in my footwear choices I wouldn’t be dealing with them now. But I suppose it could be much worse. It’s brogues and slip-on for me now. Thanks Karen! I’m excited to improve my video creating/editing skills and will do more in the future. 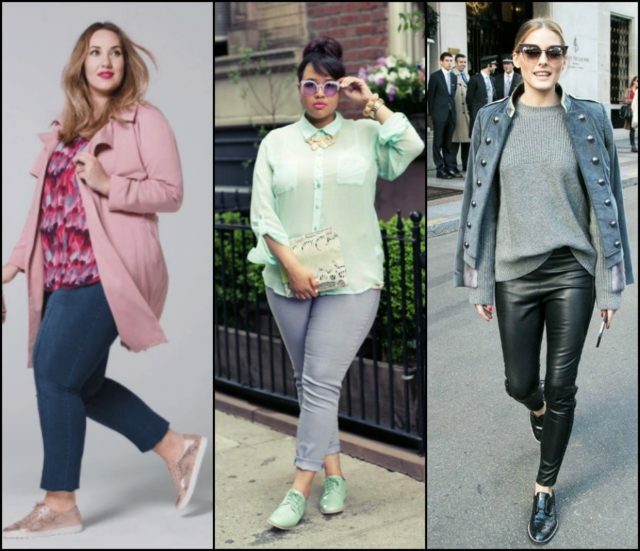 I think we’re all realizing we did some pretty bad stuff to ourselves in the pursuit of beauty and style; it’s like the fashion industry also realizes it by offering so many more cute styles that are foot friendly! Love the video – please do more! As I my feet are enormous I only have the option of the most awful extremely wide fit shoes that don’t even fit properly, so I stopped buying shoes, saved the money, and had a pair of Oxfords made to measure. Since I had been in and out of black (the only option to “nursing home beige”) I ordered them in silver! While the weather doesn’t allow me to wear them these days, I did have fun with them last month – styling them with ankle length trousers and glitter socks. So until the snow sets in, I say go with shorter trousers and fun socks to celebrate those new shoes! You said that long pants with lace-up shoes look dated. What do you suggest for women who do not have smooth, blemish and scar free ankles? As someone with thick, lumpy ankles with quite a few scars on them (I sometimes blur out one of them, sometimes not but there’s an icky red one on my right ankle in front from falling off a treadmill) I say WHO CARES. No one is looking at your ankles that closely, and if they are… well anyone over the age of 16 has a scar or two (or 40 or 50). I have a big scar on my right forearm and it doesn’t stop me from wearing sleeveless tops. I have pretty intense stretch marks on my stomach and still wear two-pieces to the pool. We’re far more critical of our bodies and what we perceive as flaws than others. Scars are natural, they’re proof that we’ve lived a life, we’ve survived a painful experience, and we’ve continued moving forward. That being said, you should wear what makes you comfortable and I suggest sheer hosiery like trousers socks in the same color as the shoe. It will give the same effect while blurring the skin. Thanks for the tip about the sheer trouser socks. I have some good looking new brogues I am itching to wear. And you have a point about exposed ankles. No one hardly looks at me anyway, so why would they particularly pick out my ankles to gawk at? I loved seeing you on video, Alison! I think that’s in part due to my being a long-time reader, too. You have a pleasant voice for video, so I’d love to see more. Combined with the pictures and text this gave a very complete overview of the topic. But… (there’s always a but with me… not an editor thing *at all*, harhar) when you talked about the photos on the different sellers’ websites, it would have been great if that picture had been in the video – you know how when you watch a make-up tutorial sometimes there’s an extra window inside the window with a photo or closeup? I think it would save you from having to describe the outfit first and you could go straight to explaining why it works. Does that make sense? In any case, please continue making videos! Maybe watch a few fashion-related ones on YouTube to get ideas about shots and frames and editing and whatnot (I have no clue there, sorry..). As far as the shoes are concerned: I wear my (very comfy) heeled Gabor booties far too often, which is an issue because 6 years post-partum I still have the occasional bout of pelvic pain (usually after wearing said booties for too long…). You’ve inspired me to dig my awesome gold-tone Clarks brogues out (and my black patent leather ones, and my black pointy-toe calfskin laceups…) and get to experimenting with combinations. Obviously, I agree with previous commenter Book Goddess (great handle, by the way), who said that it’s all about having *interesting* flat shoes, not boring old lady shoes. 🙂 I’m still sad my patent leather black and white two-tone brogues died… Those pink ones look like a fun replacement that would also work in summer, though! Thanks for the inspiration! I love your video suggestions… and have no idea how to do them… YET. Seriously, this is the first video I have edited in iMovie. I did one video a couple years ago in Premier and it took an entire weekend, like 20 hours to complete 3 minutes. This one took me about 10 hours mainly because I didn’t know what the heck I was doing, LOL! But now that I know how to do this much, I plan to improve upon it with each future video! And those brogues in the back of your closet sound amazing! I wish I had seen this 19 years ago when I first had to wear orthotics! Great ideas and the pictures are so helpful. I’m afraid I only watched half the video – too impatient to listen for five minutes to what I could have skim-read in thirty seconds. And I do struggle with the concept because … brogues rock! I love all lace-up shoes from ultra lightweight red shoes to the summer, to the heaviest of clumpy winter boots. Just gorgeous. Those pumps she wants to wear – yuk. Ballet flats – hideous! Proper, grounded shoes just look gorgeous with trousers, with skirts and fun tights. Especially in gorgeous colours and patterns. Go girl. You should be the most fun and the funkiest in the office. LOL I hear you Ruth, it’s why I shared most of my advice in text as well. Some people love video and some would prefer to skim! And I love your attitude about footwear! Thank you! I really enjoyed your video. I am in a similar situation, and I’m a runner so keeping my feet healthy and happy is really important to me. I prefer wearing dresses but have a hard time finding shoes to wear with them, but you’ve given me some good ideas. Barking Dog Shoes is awesome! As a lover of pointy shoes, I would remind people that you can often go up half a size to get proper room for both your toes and your orthotics. I have plantar fasciitis and have become an expert at hiding arch support in my shoes. The one thing that you didn’t mention was that you need to pay attention to the thickness of the orthotic and how it changes the fit of the shoe. If a shoe has low sides, a thick orthotic won’t work. I use all off-the-shelf orthotics and find that some (Birkenstock) are too thick for many shoes. Aetrex makes a whole line of orthotics, many VERY thin. The L100 is amazing for providing arch support to a fashion shoe (today that would be Fluevog Erika, a definite statement shoe) without changing the fit. Great tips Rebecca, thank you! I didn’t delve into the shoes because I figured there would be so many different personal needs but you covered plenty of them. AWESOME! It isn’t such a bad condition because I don’t require a full-on old lady shoe, but I do need room for an insert to support my cranky foot. There are a lot of insert options on Amazon, down to slim silicone thing-a-ma-gigs that can go into a variety of shoes. There is no fitting into a slightly too small shoe for me. They’ve got to be the right size, and roomy enough for my insert. I’ve worked it out with my Everlane shoes, which are mostly flats, but generally I’m ahead to buy shoes in person so I can verify that they’re going to work. A gal who is quick on her feet and not complaining about how much they hurt is always more attractive! I fully agree, unhappy feet are never chic! Thank you for this! I have had to make the transition to flats a few years ago and I have never felt quite right in them. I think I have been styling them all wrong. This post is so helpful to me. I would love to watch the video you made but I do not see it. I figured out the video problem (it was my browser). Hope you do more videos in future posts! Thank you! I also uploaded the video on YouTube and updated the post with a link below the embedded video. I will be sure to do that with the next video as well! Alison! That was a brilliant email and you did a fabulous reading. I also loved your comments and hope that you will do more video. My feet are quite challenging as well and I am always seeking stylish support. Many of the outfit you showed were right up my alley as I think of myself as sort of preppy glam. I think an important way to make practical shoes more stylish is by choosing an interesting color (does it come in red?) or texture (I have Mary Janes with an embossed button design). Thank you for your fabulous blog! I’m so glad you liked it! And I do think your tips for shoes are brilliant! Red shoes, yes! I think everyone should have at least one pair of red shoes.It’s a personal quirk of mine. I think those sneakers look fun and very you, Krista!